The main goal to what is content marketing strategies is to optimize your marketing ability to attract new customers. Knowing what to do and how to do it is key in using your content marketing strategies wisely. So what is content marketing? I recently read an article explaining the differences between content and content marketing. Michael Brenner published an article for the Content Marketing Institute explaining the differences and why this marketing program is so effective. Research has shown that the normal life expectancy of content placed on Twitter is less than three hours. Even on FaceBook, the content will get 75% of its total views within five hours. After this, they just fade away. This makes it vital for your message to cut to the heart of the matter before it is lost forever. This is the same problem with most advertising campaigns. They are not about giving the audience what they want. A campaign runs for a short period of time then dies. To effectively engage your targeted audience you need to stop selling and start promoting your content. So what would be an effective campaign for content marketing? Corey Wainwright, of Hubspot.com, elaborates on an effective content marketing campaign in his Comprehensive Guide For Modern Marketers. I tend to agree more on how Corey defined the term content marketing in how it relates to online marketing today. It is all about attracting an audience. 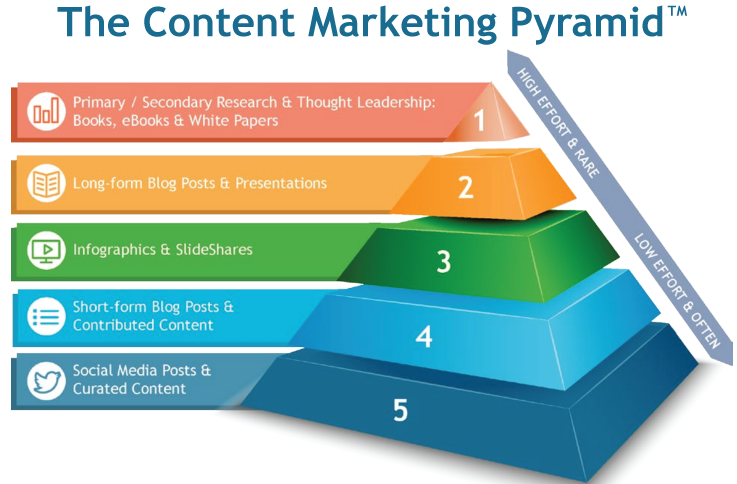 Content marketing uses different channels to convey content for a company through social media networks, blogs, visual content (videos or infographics), and premium content materials, such as eBooks, reports, even webinars. For a list of some of the many social media networks to use in your content marketing is Get Your Website Ranking At 1 or What Is Website Marketing blog posts. More business leaders are opting to create content for their marketing agendas. The reason that this is more viable is because this content lasts longer than just an advertisement. As we all know, Google has said that Content Is King. Much of this content will continue to be read, used, and followed for a number of years. For example, The blog post by Corey Wainwright was originally published in 2015 and Michael Brenner post was published in 2016. By furnishing good quality content a business will reap the benefits of this outreach for years to come. This content will continue to attract online visitors long after any advertising campaign has died and bit the dust. Your company has decided to run an advertising campaign by using Adwords as their channel. They like a particular keyword that focuses on their product. They bid $2 per click for this keyword. At the end of the month-long campaign, they are able to get 1000 leads and spent $10,000. Not bad. But what about next month? Or the month after? Is your company willing and able to continue to spend $10,000 a month for the 1000 leads it gets? This is a perfect example of using paid advertising. Yes, it works. It is immediate. But it fades and dies just as fast the second the money is pulled away. Like a faucet, when the money stops flowing, so does the leads. This concept also applies to anything where you don’t own the property from where leads are generated. By contrast, let us see the difference in, for example, blogging. Let us assume that you write a post that also gets you the same visitor-to-lead conversion ratio as your PPC campaign above, 2%. This means that if 100 people read your blog post in the first month that you will get two leads. So now your work is finished. Over time, however, that post that you published over a year ago is still producing visitor traffic to your website. Not only just that blog post but every blog post you write thereafter. This is what content marketing strategy is all about. 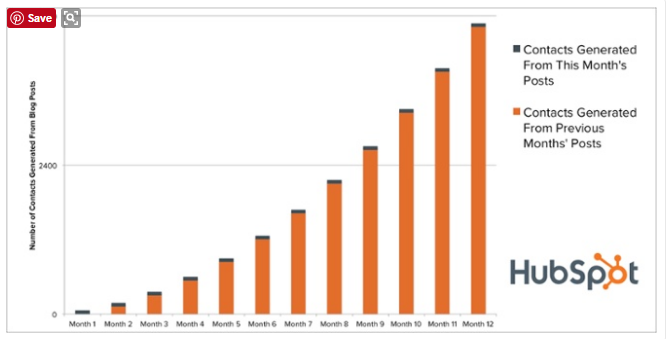 As this infographic from Hubspot below clearly illustrates the power of quality content over time. This content marketing model gives a business a predictable, scalable, and cost-efficient traffic generation for many months without continual capital expenditures. Some of the many marketing channels that work best can be used in combination to employ immediate gains as well as several months. The strategy below is a good example of the steps to take for a successful marketing campaign. A. Brainstorming for ideas – The first place to start a content marketing strategy is to create a plan. You have to know who your target market is and what will attract them. Do they have a problem that needs solving? Are they looking for new products or better uses of old ones? What can your business do to help your target market? Decide on a metrics to measure your success. This could be how many conversions, how many subscribers, social media likes, shares, comments, how many downloads of your free gifts, etc. B. Publish a blog post – The next step once you have a plan is to write a blog post pertaining to what your business will market. This can be multiple steps in publishing a post on the same subject, once a week for a period of time. By using good SEO techniques these blog post will begin to be displayed in the SERPS, which will begin to start generating traffic to your website. The higher quality blog post will ensure a continual growth of traffic for many months ahead. C. PPC – Paid per click advertising is the next step in kicking off this marketing strategy because it will generate immediate results. The other advertising avenues that have lower costs than Adwords can also be used, like Bing, Outbrain, JumpFly and Taboola. These companies offer a wide range of cost-efficient advertising to suit most businesses. This will also show how well the keywords that your company has bid on generates traffic. Sometimes this is a hit and miss procedure. This is also the reason to employ different channels of PPC to reach your ROI goals. D. Social Media announcements – Don’t wait for traffic to find your website, go out and direct them by announcing your existence in social media. FaceBook – is a great place to start. If your business has a FaceBook page and has several ‘likes’, ‘shares’, etc, then your post announcements will be published in the newsfeed for free. The paid advertisements on FaceBook are also very low and well worth the investment. Twitter – is another great social media platform in announcing the post your business has just published. The most efficient way of using Twitter is to Tweet as soon as you publish your post; then two hours later; then one day later; then one week later; then lastly one month later. Because there are so much going on in Twitter, a post will be long forgotten unless you remind people of its existence. Instagram, Pinterest, Flickr – These three social media channels are best used with pictures from your post. There are thousands of potential site visitors waiting for you to attract. Google+ – One of my favorite channels is Google+. Google has groups and communities that are much more active than other followers your company may have on FaceBook. Since Google is also one of the best search engines your blog post may get a little higher ranking with Google+ than on other SE. LinkedIn – Don’t forget about LinkedIn. One of the most popular business channels with business’, entrepreneurs, and highly successful marketers. Publish a blog post on LinkedIn for added exposure and the backlink is only gravy on your biscuit. E. Guest Blogging – By networking with highly recognized marketers in your niche the best way to generate more traffic to your site is by quest blogging on one of these sites. Send the marketer a friendly email asking them for the opportunity to help them by interviewing you on a particular subject. The more you look like an authority on the subject you wish to talk about on their blog the more open this marketer will be to your request. Send out ten to twenty emails. The possibilities are endless. Aim High. F. Podcast – Another channel that can generate tons of traffic is by getting invited to do a podcast. The procedure to get the invite are the same as for quest blogging. This works best if the podcast marketer is already familiar with you. The more that you sound like an authority the better. G. Free Gifts – The law of reciprocity is still true today. By giving away free gifts to your visitors opens up an opportunity for their willingness to oblige you with trust. The email capture routine of providing a free gift in exchange for their email address is practiced daily by almost every website. It can be anything, such as an ebook, a report, even a free product all the visitor has to pay is for shipping. How-to – Posts that show how to do something. Depending on the subject these post usually are evergreen and use the typical long-tail search terms. Numbered list – Generally these post do well as attracting curious visitors that crave information. Guides or Tips – “The Ultimate Guide to” or “10 Tips For Success” work very well in engaging the visitor with a guide that supersedes any other guide. eBooks – An extremely popular asset to give away, usually in the form of a PDF Document, given away for free in exchange for their email address. Research Reports – A longer form of a guide or tips with research data on a particular subject within your niche. Webinars – If a high profile marketer can be a quest on a webinar you are sponsoring, not only can you attract new visitors but also the quest marketers circle of followers. Infographics – These images can be embedded with links to your site and shared on social media platforms. Slideshares – SlideShare offers users the ability to upload and share publicly or privately PowerPoint presentations, Word documents and Adobe PDF Portfolios. Video – 80% of online users prefer videos over text. YouTube videos can be embedded into your blog posts, which helps your content portfolio and also helps your SEO rankings. Email – Email is still the prized possession of any marketer. It is still a great way to drive traffic, get conversions to your new as well as old content. But first of all, you have to have a list before you can do any email marketing. By writing good quality content that attracts your targeted market you should be able to drive traffic to your destination via landing page, sales funnel, or email capture premium material. Once you have their email, you can then start marketing via email. This Ultimate guide has most of the best platforms to consider using as content marketing strategies. Depending on the size of your marketing team will determine on which platform or how many platforms you decide to market at one time. I hope you found this article informative and helpful to you. I look forward to any comments or suggestions you may wish to leave. If you know anyone that could use any of this information it would be nice for you to share this article with them. In order for you to stay informed, stay ahead of your competition, and know how to use the newest online tool or technique you really have to learn from the BEST to be the BEST. Click the Learn More Button below to discover a new way of content marketing. Do this Today! I agree. I have a lawn service and I put a blog post on my site called lawn care tips. And people are getting to know me as I share these tips weekly. They may not sign up for any service at this time but if they need something one day they probably will think about me. Thanks for this article it was helpful. You are very correct Ronnie, once you publish a post it is out there for anyone to see. The better your SEO is on your site the more people that will see your post in the SE, the higher the potential of acquiring customers. This was great read. It’s tough to sum up on what I’m taking away from this post. I’m gonna read this again. I loved this one. Thank you for sharing so much knowledge. Thank you, Anubhav, for reading my article. It is all about what a website owner must do to attract visitors to their website to increase traffic and hopefully make conversions and sales. Podcast and guest blogging is something new to me. I would like to learn how this could benefit my site. I am writing my own original contents for my blog. I am glad that you have found some new strategies to help you attract visitors to your own original content, Jamin. Podcast and guest blogging help you inform tons of other online users about your existence so that hopefully they will visit your site. Love this post and I like your diagrams as well. I have bookmarked this so I can go back to it again. Thanks for a great post. I appreciate your time reading my article, Helen. This article is all about how to attract visitors to your website. The better the content that you publish the better rankings in the search engines you will get. This will attract more visitors and consequently more leads that become customers.